At Belleau Wood —Part II – Fix Bayonets! On 4-5 June, American forces continued to repel German assaults. The French 167th Division arrived, allowing the US 2nd Division to consolidate his 2,000 yard front. Early in the morning of 6 June, the allies launched an attack on German positions, who at that time were preparing for their own assault. French forces attacked to the left of the American line, Marines assaulted Hill 142 to prevent German flanking fire into the French advance. The 2nd Division’s mission was to capture the ridge overlooking Torcy and Belleau Wood and occupy the wood preventing German forces it use. The Marines, however, had failed to detect the presence of the 461st German Infantry Regiment, which had prepared exceptional defensive positions and interconnect automatic weapons coverage and pre-registered artillery fires. At dawn on 6 June, Major Julius Turrill led the 1st Battalion, 5th Marines (1/5) into the attack of Hill 142—but only two of his companies were in position when the order went out to commence the advance. Marines advanced across the wheat fields with fixed bayonets —and many of these Marines died before their bodies collapsed to the ground. Captain Crowther, commanding the 67th Company, was almost immediately killed. Captain Hamilton and the 49th Company fought from wood to wood, killing entrenched Germans wherever discovered. By this time, Hamilton had lost all five of his junior officers. Only one officer was left alive in the 67th Company. Hamilton quickly organized the remnants of two companies into a single organization. The rest of the battalion finally arrived and went into action. Turrill’s flanks were unprotected and the Marines were rapidly exhausting their ammunition. NCOs reminded their men, “Shoot to kill.” By mid-afternoon, the Marines successfully captured Hill 142. It cost them 9 officers and most of thee 325 Marines of 1/5. Not long after ordering the advance, Major Berry received serious wounds. Major Meyers led his Marines into the southern end of Belleau Wood, encountering heavy machinegun fire, sharpshooters, and barbed wire designed to channel his Marines into German killing zones. Marines and Germans soon engaged in hand to hand fighting. Casualties on this day were the highest in Marine Corps history up to that time —exceeded only by a far distant melee at a place called Tarawa. On this day, Marines lost 31 officers and 1,056 enlisted men. Still, the Marines had a foothold in Belleau Wood and they were not letting go. The battle was deadlocked. At midnight on 7-8 June 1918, German infantry assaulted the Marines, but the Marines stopped them cold. Marines attacked the Germans on the morning of the 8th, but they too were halted by intense German fire. By now, Meyers’ battalion sustained 400 casualties. Harbord decided to pull 3/6 off the line and replace it with 1/6, commanded by Major Hughes. After Berry’s evacuation, Major Maurice E. Shearer assumed command of 3/5. 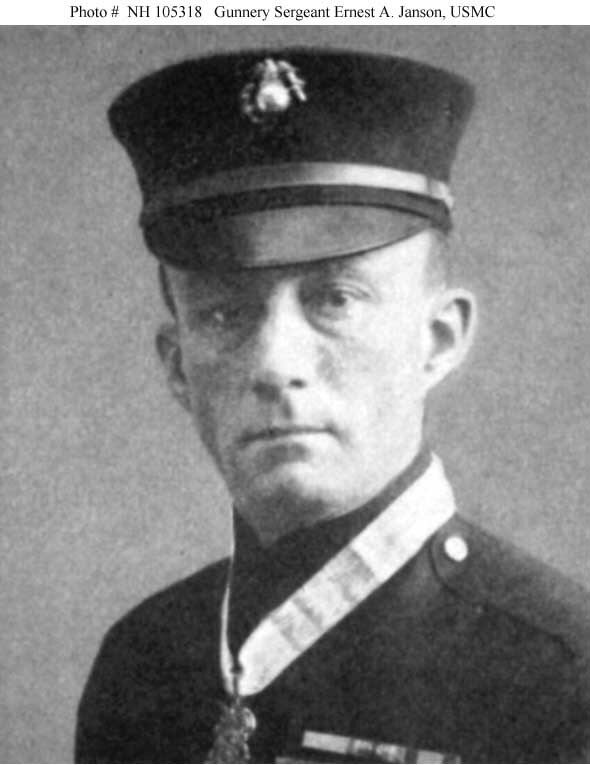 Sergeant Major Ernest August Janson (1878-1930) served as both a US soldier and a US Marine. After serving for nearly ten years in the Army, he enlisted into the Marine Corps in 1910 and in view of his prior service, the Marine Corps appointed him to the rank of Corporal. At the time of this particular service, Janson was serving temporarily as a gunnery sergeant, a wartime appointment. Janson was the first Marine to receive two Medals of Honor for the same action: one bestowed upon him by the U. S. Army, and the other by the U. S. Navy. It is no longer possible for anyone to receive two Medals of Honor for the same action. I previously wrote about Captain Hulbert on 22 October 2013. 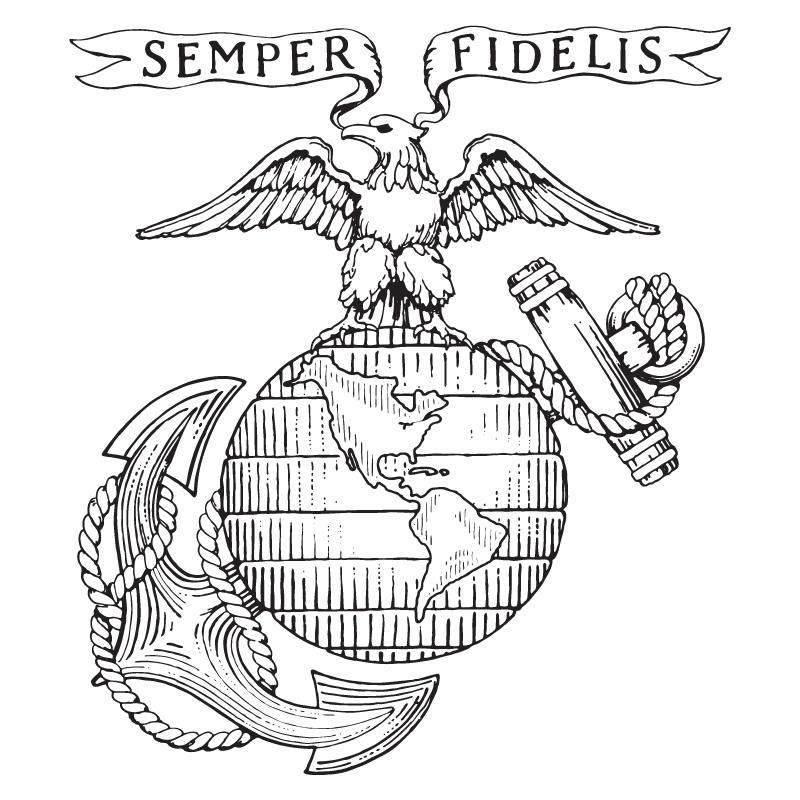 Marine Corps Commandant Major General John A. Lejeune once acclaimed Sergeant Major Daniel Joseph Daly (11 Nov 1873-27 April 1937) as the outstanding Marine of all time. Major General Smedley D. Butler added, “Daly was the “fightingest Marine I ever knew.” Dan Daly and Smedley Butler were the only two Marines to receive the nation’s highest award for two separate acts of valor. Daly was a small man in stature, but he more than made up for this in terms of courage in combat. See also Handsome Jack and Someone Has to Know How.